The Segway is a means of transport that is right on trend. It’s electric, so it’s environmentally friendly and fun to drive. In many cities of the world with many tourists Segway city tours are offered, also in Florence. You first learn how to drive a Segway, a lot of participants of such a city tour are on such an ultramodern vehicle for the first time. Afterwards you go on a city guide through Florence. 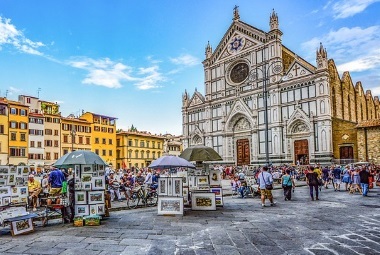 You drive with many stops through the oldtown, the guide explains the sights of Florence as during a normal city tour. The popular Segway tour in Florence is offered in small groups, several times a week. The tour and the tour guides have received very good reviews on various rating portals in the internet. The first half hour is training on the Segway, then it goes about 2.5 hours through Florence. Almost every participant is enthusiastic about the Segway tour. The Segway including helmet is of course included in the tour price. If it rains, the organizer will give you a rain cape (poncho). The tour is in English. When booking on the link above, cancellation more than 24 hours prior before the tour will result in a full refund. What exactly is a Segway? The Segway is an electric vehicle for one person. You stand on a platform between 2 wheels. You hold on to a vertical bar. The wheels are each driven independently by a motor. If one wheel turns faster than the other wheel, you take a bend. The control by shifting the weight is learnt quite quickly. 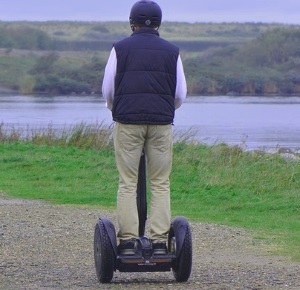 The Segway is powered like an electric car or an e-bike by an electric motor with a lithium-ion battery.